Do you have a tree in the wrong location? 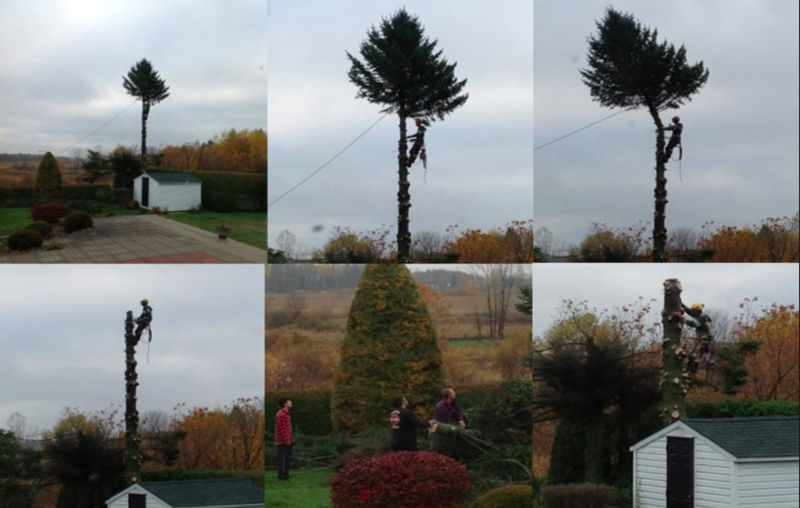 Bisson Services can help you decide whether or not a tree should be cut or removed. Trees that are too close to houses and other structures, or certain species of trees planted in the wrong location, are all candidates for removal. Trees of this nature pose threats during hurricanes, tornadoes, strong thunderstorms, and during ice and snow accumulation. After all, if one of these trees loses branches or falls over, it is likely to cause costly damage. These trees can also cause damage to foundations, lift sidewalks, lead to mildew on siding, rub paint off structures, clog gutters with leaves, provide a path for squirrels, ants, and other critters to get into your home or business, and much more. Do you need a tree cut down, hauled away or just not sure if one is dead? Is there a tree that concerns you and you think it is a hazard to your home or commercial business. With Bisson Services tree removal and cutting services, rest assured that your tree or trees will be cut down safely. Tree cutting is a dangerous job to perform and should be done by experienced and insured tree cutters. To ensure no damage is done to your property, let our highly experienced arborists deal with your tree cutting and/or removal. Whether you have a simple tree cutting task or a complex, multi-day tree removal project, contact Bisson Services today for a free estimate! A Bisson Services professional will be sent to meet with you in order to determine which trees need to be cut and/or removed and to help formulate the best plan of action.